You are currently browsing the category archive for the ‘Bicycle’ category. The cycles were hired from chettrapati at Rs.275 per day with helmets, pumps and puncher tools a day before the tour day, on Friday. 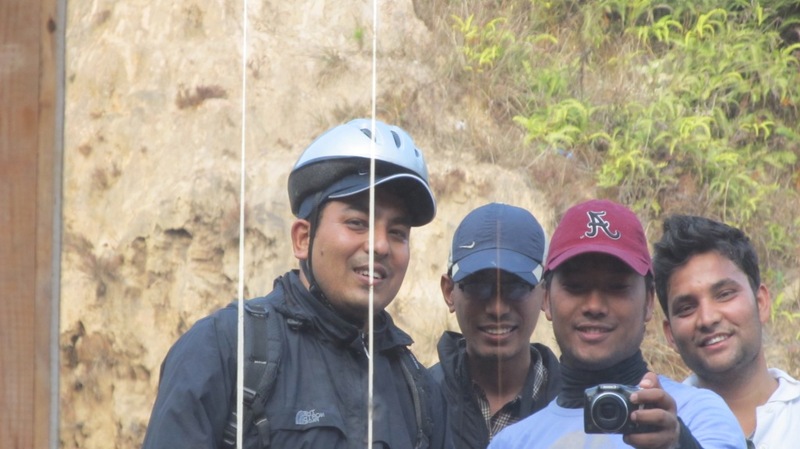 At 7.30 am on Saturday, Sabin, Arbin, Sakund, Maheshowor dai and myself gathered at Baneshwor from where journey to Nagarkot started on the muscle power and two wheels. The foggy morning on the Suryabinayak highway was chilling to bones. I had to buy gloves on the way to beat this cold. The wide 6-lane road was an opportunity for warm-up. After peddling for 15km, at 8.15am we were at Kamal Binayak at Bhaktapur. Jeri, puri, tarkali, pakoda and tea was the breakfast at Kamal Binayak. After brief shopping for tiffin, we were ready for the uphill journey. Nagarkot is about 30km from Kathmandu and lies at the altitude of about 2150m . 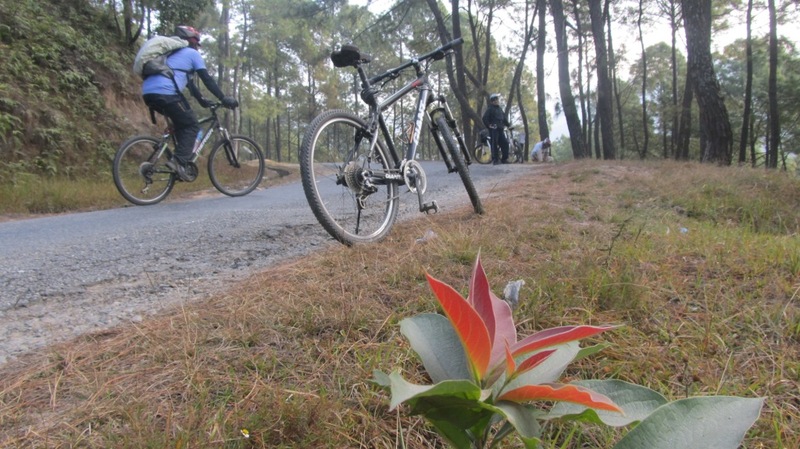 The uphill cycling journey is 15km from Kamal Binayak. This route is perfect for the starter cyclist who wants a tough yet easy ride. Furthermore, this route is also very close to Kathmandu and vehicle are available incase of emergencies. And if one wants an easier ride, he can take the bike on the bus and return downhill journey only! The time we were riding was the school time; hence lots of school children were seen on the way. The waving hands of children and school girls were an encouragement to the journey while the fat breaking tough ride was harder part. To pass each kilometer stone was a challenge to accomplish. On the way lots of couples on motorbike were seen. Since Nagarkot is close to Kathmandu, it is ideal place for couples to pass some time together in peace and private. Energy was draining out of the body. Even the intake of glucose couldn’t give enough energy to peddle the bike. About half kilometer before the Nagarkot, the situation was worst and the team couldn’t peddle further even an extra meter. With grace of god and human effort we were top of Nagarkot at 12pm. But we had few more kilometers to peddle to reach the view tower of Nagarkot. For this 3 km of journey it took 3 hours. The body was deprived of energy so we had to rest in between to recharge the body with food and some more time were spent to click photos. Finally after reaching the view tower the energy was revived by the beautiful view of mountains. The view tower was crowded with young people who had come for picnic. More interesting activity was that people were trying to climb the leaderless view tower through the truss. After that, we returned to Nagarkot for dal-bhat. Rs. 170 for vegetarian food is a bit costly than normal price of the food. However there were no alternatives. At 4pm we started downhill journey and at 6pm we were at Baneshwor. On the way we took a brief intermission at Bhaktapur. Some photos at Nyatpol and few more at the Bhaktapur durbar square were taken. We were at Chettrapati at 7pm to return the bicycle to the shopkeeper. A day full of cycling without any prior exercise had made our legs very stiff and pain was observed. Further there was pain in pelvic muscles due to seat of bicycle. In summary, whatever happened in the journey, it taught us one thing that “will is the power to win”. Youtube. This was a bicycle rally. The tour was from Kathmandu to Charikot. The basic reason for the travel was to give farewell to Mr. Puskar Shah who was going to climb Mt. Everest. He has already travelled 150 countries in bicycle. The rally started on 7th of April 2010 and lasted for next 3 days. As scheduled all people had gathered at Khulla Manch and we all travelled to President’s House. A formal programme was organized to hand over National flag to Puskar by the president. The programme consumed lots of time unnecessarily. After the programme was over we tied flag of 150 nations and rallied across the city traversing Patan Heritage Site. After that we travelled to Banepa crossing Bhaktapur and having launch on the road. Nirjala sis(right) at Dhulikher with another psyco..
Local people of Dhulikhel had organized a programme to welcome our rally so we had to stop there. Dhulikhelis were serving serious stuff (raksi) for good luck. I wonder would it bring good luck or good accident. For next 10 km the travel was downhill from Dhulikhel to Panchkhal. And lots of scratches as well. How many people fell off from there bicycle? No records. Had there been some girls riding the bicycle then surely the record would have been doubled. From Panchkhal we had to reach Dolalghat. Dolalghat was the final destination for the first day. At Dolalghat open camp was organized to pass the night. More raksi at the camping site was provied which made some of our guys sing the song for rest of the night while rest of the guys couldn’t sleep due to irritating noise of the song. The song became like a theme song for the rest of the trip. The song was “हे बैनी कमला……आफ्नो जोबन आफै स्महाल”.Ah.. its irritating to write it as well. Next morning was no good as well because when we woke up all the guys already had had their brekfast. So we were left hungry in the morning. With Glucose-D power from Anoj we travelled toward Khadichour where we had our launch as well. From this place there is steep uphill climbing so the organizer had planned to carry us and our bicycle on bus. From Khadichour to Kharidhunga we were in bus. Then again on downhill slope to Charikot we were riding our bicycle. Before reaching Charikot a programme was organized to welcome us near the house of Puskar where his mother put tika and gave us Mohi to quench our thirst. After mess up for arranging room to sleep, we were taken for the dinner 1km away from the lodge. Some (stupid) girls had gone to temple so we had to wait for them at the hotel which consumed more than an hour. Early in the morning we cycled to the same temple which made us wait the previous day. The temple is called Dolakha Bhimsen. On the way Naran injured himself at the steep bend on the downhill. However he managed to reach the temple and return back as well. After returning back to Charikot bazzar and brief photosession we loaded our bicycle in the bus and travelled back to Kathmandu. We reached the kathmandu on the same day. It was friday. Photo session at President’s house…. On 18 March 2010 after landing at Pokhara Airport, we travelled to inspect the Modi Hydropower Project which lies about 70Km toward Baglung-Pokhara highway from Pokhara. A huge construction work was being done to generate 10 megawatts of power from water. After the job was completed we returned to Pokhara to stay overnight. We had dinner at Sangrila and bed at Trek-O-tel. Interesting names! Next morning I took a bicycle and ride towards Pame, the same place where we had travelled on Jan-1. Boating at Phewa Lake was like mandatory to me because visiting Pokhara without boating and biking is like not visiting Pokhara at all! When I returned back to hotel after biking I felt hungry and we had to chek out from the hotel as well. So we packed our bags and went to seek out restaurant for launch. In the way I saw a hotel named Hungry Eye Hotel. The name of the hotel striked me really hard because it felt so real to me. I was hungry and my eyes were seeking for a food place and then came the name of the hotel. Amazing it was! But we ate at different place however.